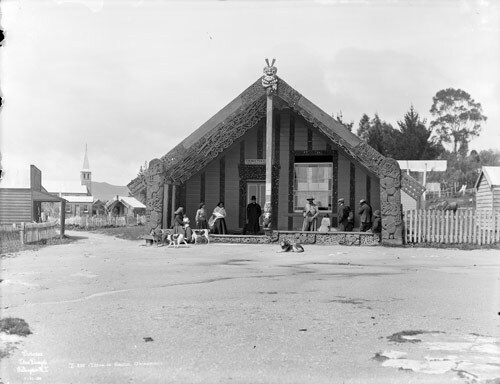 This meeting house was named after the captain of the Te Arawa canoe. The house was built in 1878 to ratify the peace between the Te Arawa and Waikato tribes. Interestingly, some of the timber used in the original construction was obtained by cutting up the canoe named Hamama. Some of the carved panels were also recycled from another carved house named Parerewha, which, it is said, had originally stood on Pateko Island in Lake Rotoiti. The Tamatekapua meeting house was demolished in 1939, but was rebuilt and opened again in 1943.